Given that team leaders are involved in people management and operations coordination, this leaves little time to focus on the front-line in the future. 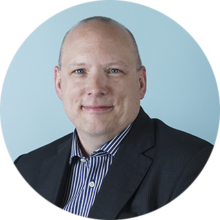 This change in focus will dramatically alter the composition of a team leader’s role. This will, in turn, adversely impact operational performance within an organisation. To remedy this, we developed a new organisational model for operations management. Our model bridges the gap between what’s desired (multi-skilled, highly competent and experienced people) against what’s available. The central purpose behind this new model is to focus teams on the few critical tasks that make a difference to operational performance. For back office processing this is the control of work, whereas for telephony this is agent coaching. The new Operations Management model is based on a split role. Each team of around eight people has a team captain (sometimes known as a flow leader or team coach) who is responsible for maintaining workflow. They will also typically process for 50% of the time. Three to four such teams report to a single front-line manager (the first hierarchical management grade) who is responsible for the operational performance of their teams, including all people management issues. Maintaining control of 30-40 staff is achieved through the application of rigorous operational disciplines and a high degree of visual information. Front-line managers will typically work with a time horizon up to three months, though their priority focus is always day-to-day performance. Between two and four front-line managers typically report to an operations manager, who in turn reports to a centre manager. These roles also need to evolve, but remain much closer to a standard role and span. However, the stability and control that comes from the front-line manager concept reduces the amount of fire fighting that more senior managers must deal with. In turn, this allows greater focus on management coaching and leading operational improvement. The overall cost of this new structure is neutral. The additional management headcount is offset by flow leaders processing for 50% of their time and the removal of central quality checking in the telephony environment. 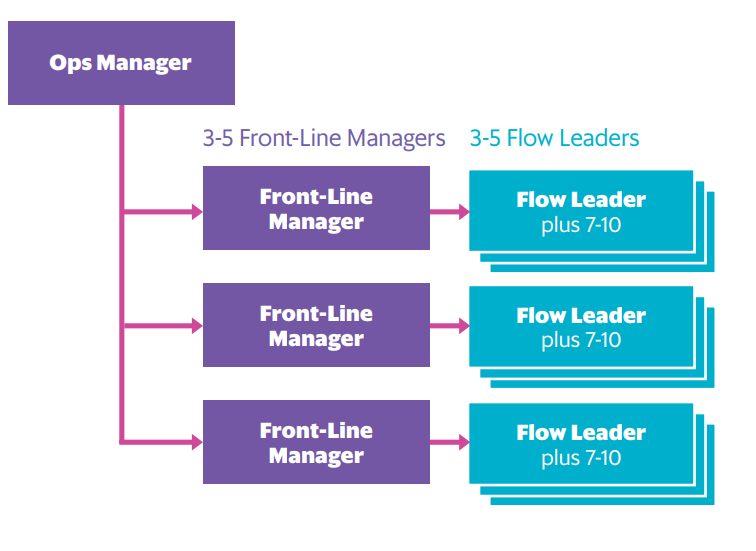 Front-line managers tend to be a slightly higher grade than traditional team managers, whereas flow leaders tend to be a lower grade. Traditional structures have a large grade gap between team managers and operations managers. This results in poor succession planning and limited opportunities for development. Our front-line manager model offers an alternative that is appropriate for graduate level staff and provides a larger talent pool from which operations leaders of the future can be developed. Spans of control will clearly vary, depending on work type. This model is a framework, rather than a one size fits all approach. • Typically ‘working’ 50% of the time. • Focuses on short term tasks – stable even flow, daily activities, visual management, coach ‘one best way’. A financial services business was experiencing issues across it’s processing centres, with spiralling costs, decreasing productivity and an increasing number of errors. This was leading to low employee engagement and high attrition. By piloting the new Operations Management model in one centre, we were able to prove the benefits, and the business case was approved for implementation across the organisation’s centres; totalling around 3,000 full-time equivalents. The results from this business-wide roll out were spectacular. Errors decreased, productivity dramatically improved, unit costs reduced and there was a significant uplift in employee engagement. Our new model has been successfully deployed across multiple sectors.